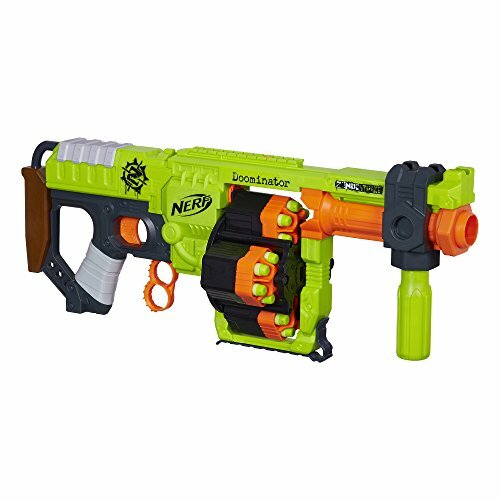 The Nerf Zombie Strike Doominator is a pump-action shooter that is capable of unleashing a rapid assault when switched to the slam-fire mode. Its impressive 24-dart payload are housed in 4 (6-dart) drums. You can shoot 24 darts without reloading! The four dart drums flip in line easily and reload without any trouble. The Nerf Zombie Strike Doominator comes with 4 flipping dart drums that mimic the functional efficiency of real gun cylinders. Each of the dart drums has a capacity of six darts, which makes up 24 darts in total. The designers included this lever so that you do not have to move the four dart drums manually. The graceful flipping of the dart drum is greatly enhanced by the reliable functioning of the ringed lever. The lever aligns the next dart drum in a position that enhances the shooting action and subsequent reloading. When used properly, this lever minimizes the chances of jamming. Nerf made it convenient for the shooters to hold and position the blaster according to their preferences. The advanced shooting mechanism of the Nerf Zombie Strike Doominator is made possible by the incredible trigger action. Compared to many other pump-action toy guns, this gun has more advanced triggers that impact greater harmony to the shooting mechanism. Experienced shooters prefer this plastic housing because of its combined merits of durability and lightness. This blaster only weighs 1.4 pounds, which makes it uniquely ideal for the fun time of an eight-year-old. Despite the complex details of its shooting mechanism, this gun is highly flexible during field action. You will find this blaster quite easy to carry, position and aim because of its reliable drop grip. For the younger crowd, this shooter is uniquely convenient because it supports the pump action that launches its darts on selected targets. Q. How much does the Nerf Zombie Strike Doominator weigh? A. This blaster weighs 1.4 pounds. Q. How many darts does each drum dart hold? A. Each of the four drum darts holds 6 darts making them 24 in total. Q. What colors are the darts? Hint: click or tap the stars for the most helpful Nerf Doominator Amazon reviews. Nerf Doominator mod kit & step-by-step guide coming (very) soon. Click here to be the first to know when it's ready! Nerf Doominator range test coming soon! Get the Doominator Mod Guide!